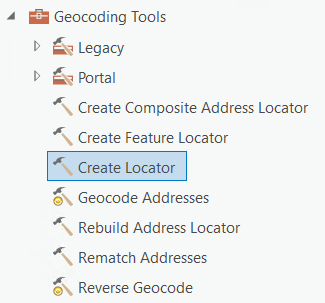 If you have decided that you need to create your own locator because you have a need to geocode against your own data, you can do so in ArcGIS Pro. Creating your own locator allows you to find places and addresses on the map using your own data just as you would using the ArcGIS Online World Geocoding Service. On the Analysis tab, click the Tools button to open the Geoprocessing pane. Select the Create Locator tool. In the Geoprocessing pane, click the Toolboxes tab. Click Geocoding Tools from the list of geoprocessing toolboxes. Click the Create Locator tool from the list of geocoding tools. Once the Create Locator tool opens in the Geoprocessing pane, click the Role drop-down list, and choose the role on which you want to base your locator. For more information on choosing the right role for your data, see Introduction to understanding locator roles. Click the Browse button next to the Reference Data text box. The Reference Data dialog box appears. Browse to the reference data you want to use in the locator, and click Open. If you have more than one dataset that you want to use in your locator, you can repeat the process of adding data to the Reference Data text boxes (more appear as needed) until all the reference data you want to include in the locator shows in the tool. In addition to your primary reference data tables, you may have tables containing information for alternate names of streets or cities. For more information about using alternate name tables to create your locator, refer to Fundamentals of alternate name tables. When creating an address locator with reference data that contains millions of features, it is necessary to have at least 3 to 4 times the size of the data in free disk space on the drive containing your temp directory because files used to build the locator are written to this location before the locator is copied to the output location. If you do not have enough disk space, the tool will fail at some point during execution when it runs out of space. Also, keep in mind that when creating very large locators, you should have a machine with enough RAM to handle large memory-intensive processes. Click the drop-down arrow in the Alias Name column and choose the proper field name to map fields in your data to fields expected by the locator role you have chosen. An output file name and destination are automatically selected. To change these values, click the Browse button next to the Output Locator text box. The Output Locator dialog box appears. Specify where to store the locator (the save location must be in a file folder), name it, and click Save. If you need some helpful tips and reminders about any of the input categories on this tool, click any of the Information buttons displayed next to the input categories for additional information. When the process finishes, the locator is added to the Locators folder in the Catalog pane. You can also find your locator in the save location you previously specified. You can add your newly created locator to a new or existing project.